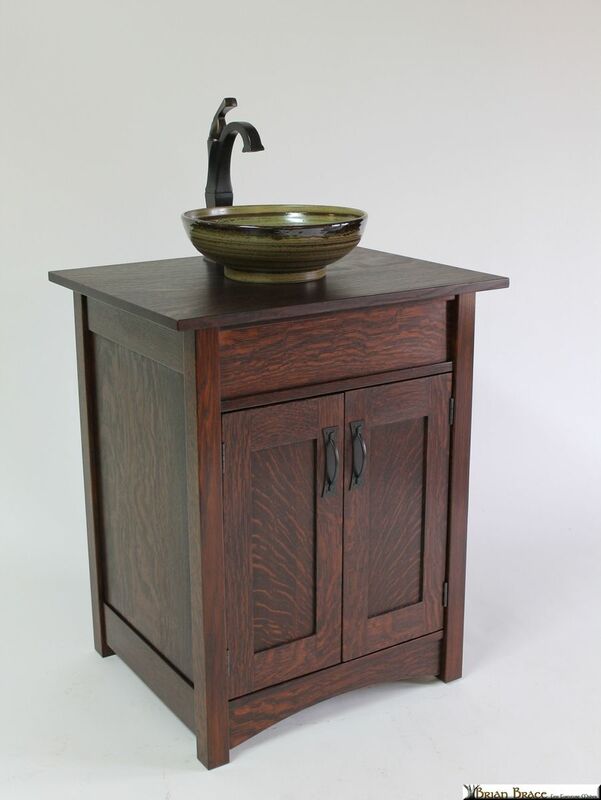 This Mission Style Artsink Vanity is a collaboration of two local Asheville, North Carolina area artists. When I heard of Ed Racicot, the owner of Artsinks in Asheville, and saw some of his work, I had to collaborate on a piece with him. This piece is made of solid Quartered Oak with a medium dark beautiful dye stain. With these pieces the price varies, depending on the bowl you choose from and faucet. The piece shown is fitted with a Delta style sink in Rustic Forest Glaze. The faucet is Delta Dryden in a rubbed bronze finish, with Lux Push Top drain, also in rubbed bronze finish. Price for this piece as shown is $2300. Together, we are building up a line of different vanities, so if you have a different design in mind that you would like to have us design for you, please contact us. If you are in the Asheville area, plan your visit to my showroom. I am located 15 min east of Asheville.